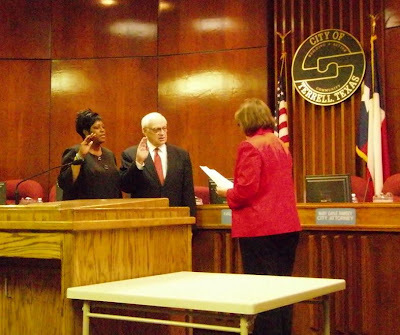 Sandra Wilson taking the oath of office last night as the newest member of the Terrell City Council representing District 2. Congrats Ms. Wilson, good luck, I am sure you will do a great job. Tricia has a nice story posted on the Tribune's website. Also taking the oath of office (again) was Mr. Jack Jones. Mr. Jones is my Council Member, and ran unopposed in the last election. He has served on the Council since 1988 except for one 4 year period. I did learn something new at the meeting, that directly relates to my day job (the one that pays). My position at work deals with negotiating leases for space on communications towers for antennas. In order to be able to place antennas on towers or on rooftops, we have to get building permits or Specific Use Permits (SUP) from City or County governments. I don't submit for the permits or have to appear before any boards, but I do have to track the progress and report the status to our higher ups. At the Council meeting there was a public hearing and then a discussion about a request for a Specific Use Permit for a company that is looking to do business in Terrell. The next time I ask for the status of a permit or SUP from a field tech, I will not get aggravated when they say there was no action taken. I found out last night, its not something that's done quickly. With almost every answer there is a new question. Have y'all been following Astro_Mike on twitter? Its astronaut Mike Massimino sending down tweets from the space shuttle. Here is one of his messages from yesterday: From orbit: Listening to Sting on my ipod watching the world go by – literally. How cool is that? I don't live very far from City Hall so I walk up there and back. On my way home. I saw a car coming up the street and turn on the street I was going to be walking down. It was a nice night and they had their windows down. Just after turning, I heard a ladies voice say "stop". I thought she was talking to me so I stopped. I was on the sidewalk and then saw the car stop. I was about even with the back bumper. I started walking again and when I got even with the window, I heard the lady in the passenger seat say "you didn't turn on your turn indicator, you have to signal before turning". I smiled and kept on walking. The car started moving again and as it passed me I heard "turn on your right turn signal" thankfully the young kid did as he was told. When the car reached the stop sign that was ahead of it, it sat there FOREVER. Long enough for me to almost catch up to it. I then heard the lady say "now turn to your right....I said right!". I got to the corner and waited for the car to turn, trying not to laugh. Once it got past, I could only wonder is that what my Mother went through while trying to teach me how to drive. My mom used to say she was going home to take a Valium. That was way back in 19 somethingorother.